Found 8 file extension associations related to Website X5 and 8 file formats developed specifically for use with Website X5. 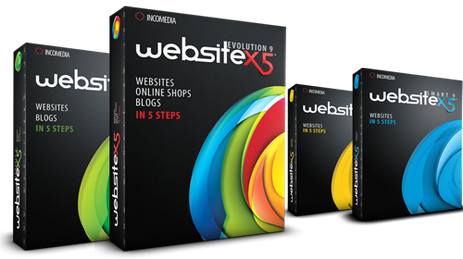 Website X5 is a software program that offers users easy and powerful way to create their websites. It comes in 4 versions: FREE, SMART, COMPACT and the most complex edition called EVOLUTION. All editions are only available for Windows platform. WebSite X5 is professional, simple and original. It works as a guided tour and is the ideal solution for people who have no HTML programming or web design experience, but who want to create a professional website by themselves, quickly and cost-effectively. It has a rich gallery of ready-to-use templates. It is highly flexible and, with its built-in editors, it is completely open to graphic customization. The menus are dynamically generated and updated. It has numerous advanced features for creating and managing blogs, e-commerce, members' areas, multilingual sites, RSS feeds, advertising. It has a built-in FTP engine for publishing your site on the Internet, and subsequently updating only the parts that have been modified. There is no limit to the size or number of sites you create, even for commercial use. Your websites can be fully optimized. If you need more information please contact the developers of Website X5 (Incomedia), or check out their product website.